Won’t someone please buy Eminem’s old bricks? Never one to shy away from the fine art of mythologizing the past, Eminem is now literally selling off pieces of his old childhood home to fans. 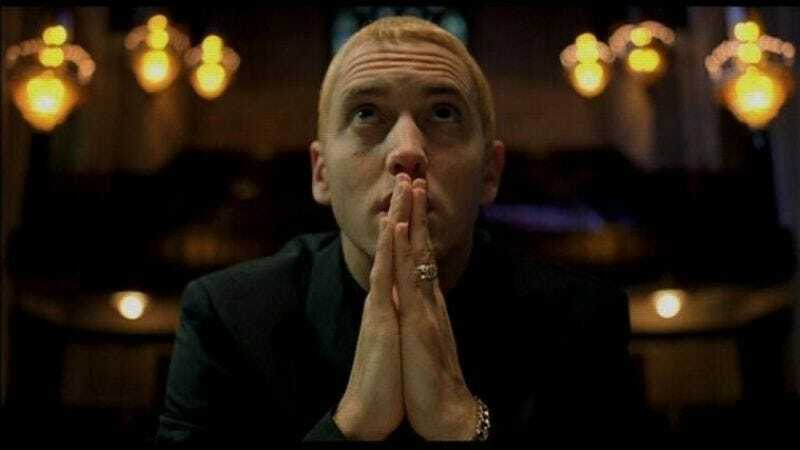 To commemorate the 16th anniversary of his bestselling The Marshall Mathers LP, the Detroit-based rapper has announced a collectible box set featuring a cassette copy of the album, alongside a brick from the house in which his mom’s famous spaghetti was once prepared. The house—at 19946 Dresden Street, Detroit—was knocked down in 2013, after being declared unsafe by the state of Michigan. Now, Eminem is cleaning out his closet, taking the house’s materials and putting them on the open market. He’s apparently fashioned its wood into dog tags—commemorating, presumably, his service in 8 Mile’s lethal rap battles, rap sorties, and rap wars—and the bricks into “conversation starters,” albeit mostly conversations about how you spent $313 on one of Eminem’s pet bricks. Some of the proceeds from the sales will go to Eminem’s Marshall Mathers Foundation, which provides funding to programs working with at-risk youth in the Michigan city. It’ll also come with a certificate of authenticity, in case anyone has the temerity to doubt that your prized brick was once one of several that taught Slim Shady the concept of “shade”.